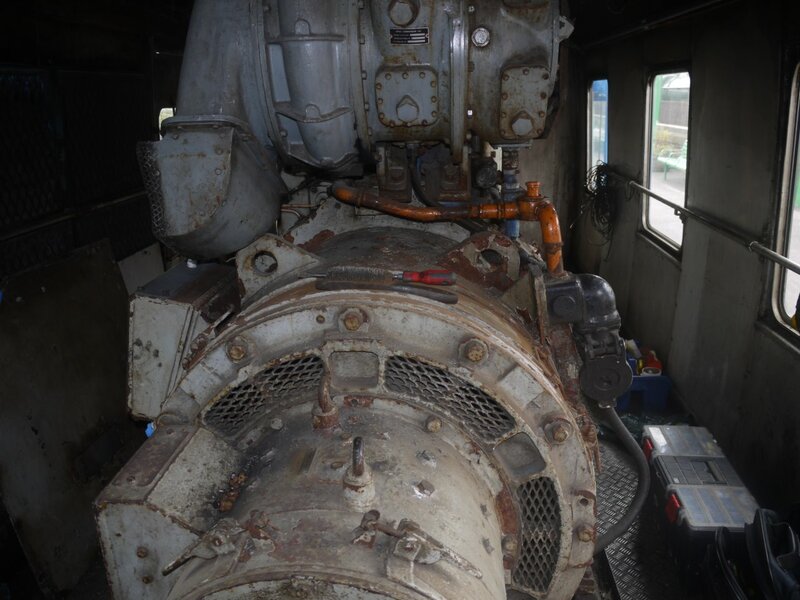 In our May blog, I have attempted to give a snapshot of the teamwork required, involving many talented people to not only keep our home Diesel Locomotive fleet maintained and running, but also to strive to constantly improve their general condition. It also shows how many of our volunteers – skilled or otherwise – are willing to move out of their comfort zone and learn new trades. 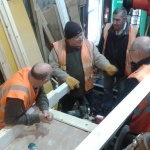 If you have ever thought you would like to get involved with Railway restoration, be it Locomotive, Carriage and Wagon, railway buildings etc, then why not come down and talk to us, and see what it’s all about. You do not require any special skills – everyone has something to bring to the party, and it’s not just a ‘man thing’, everyone’s welcome. 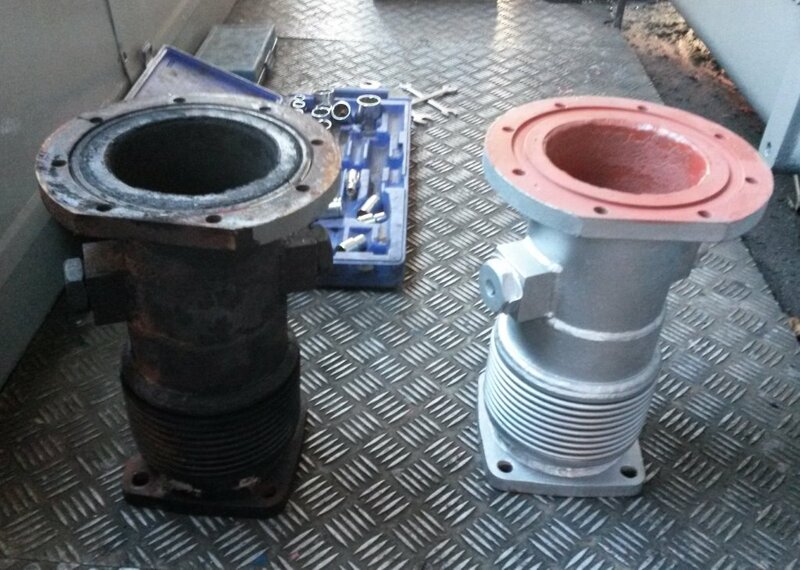 The Diesel restoration group normally meet on a Thursday around 09.00, but we are flexible. (Other groups meet at different times.) There are also lots of ‘Operating’ volunteering jobs for those interested in ‘running a railway’. 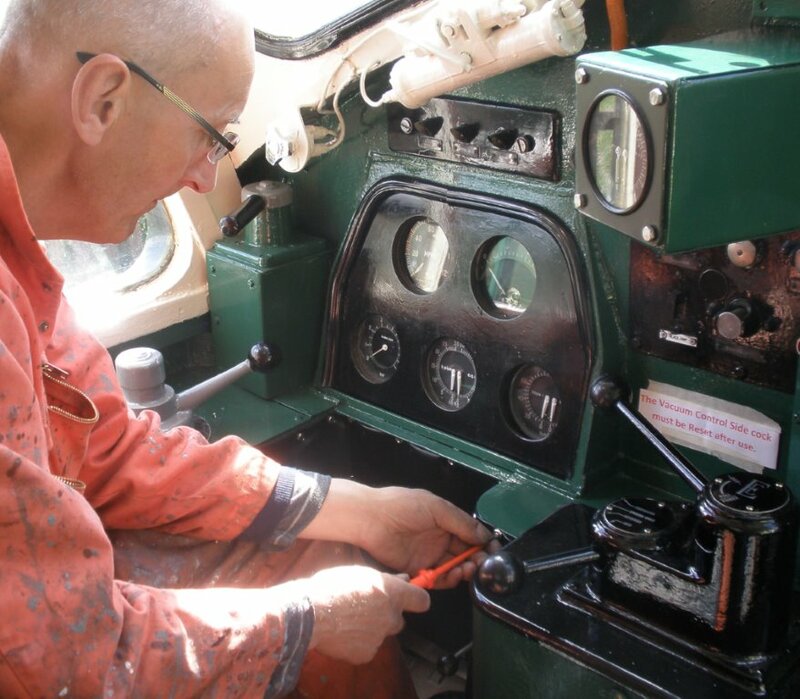 The team spent several enjoyable days cleaning the Locos and performing spot repairs, in readiness for the recent Diesel gala, which proved a big success. The locos now look clean and shiny. 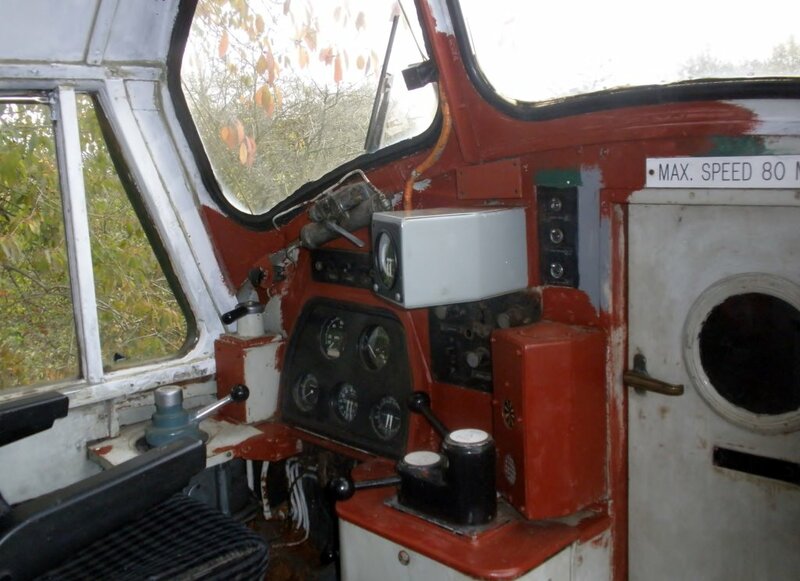 Don’t forget, normally you can ride in the cab of one of our Main Line diesel locomotives or the DEMU Thumper for only £5.00. Just talk to the driver. 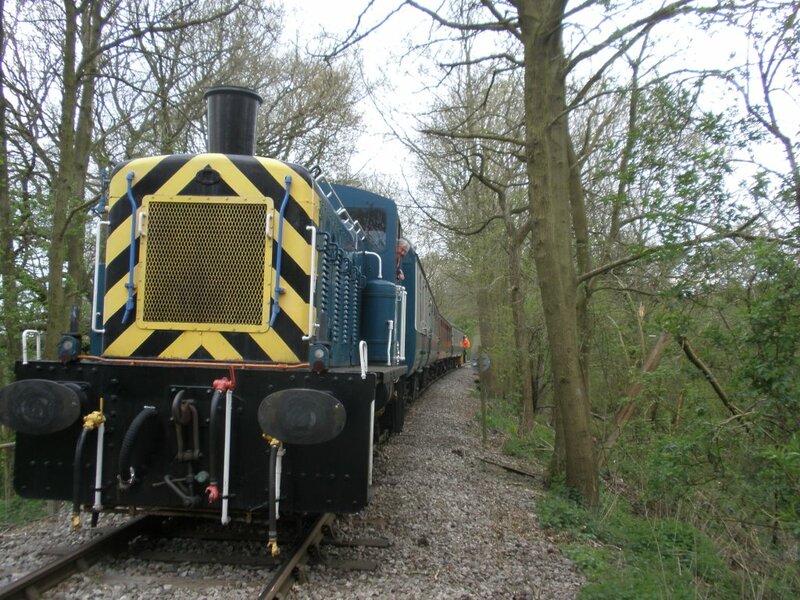 We had a rare chance, on a preserved railway, to compare our own restoration work directly with a main line equipped Loco which had just received a major overhaul. 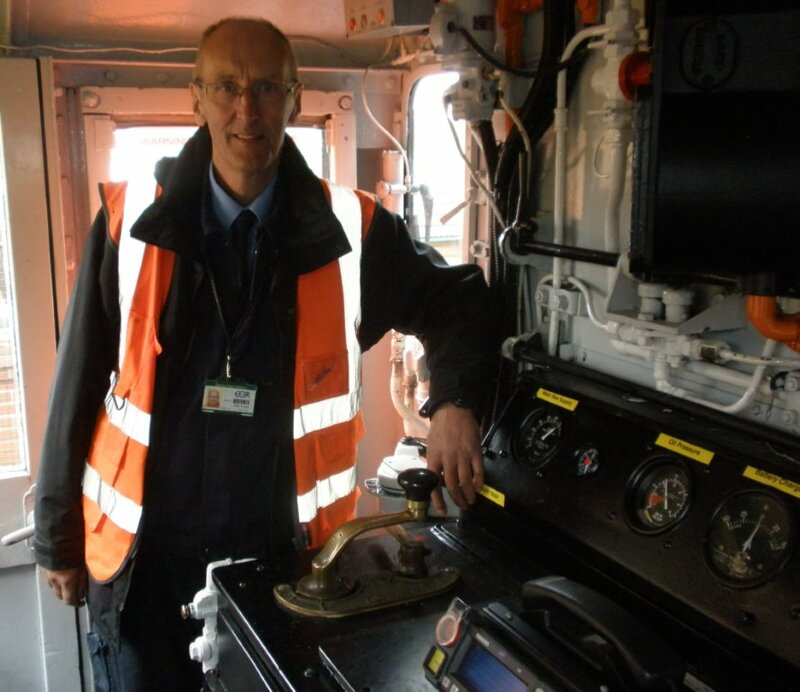 It has been many years since Chris last drove a main line registered 08 shunt loco, and he clearly is enjoying the experience. 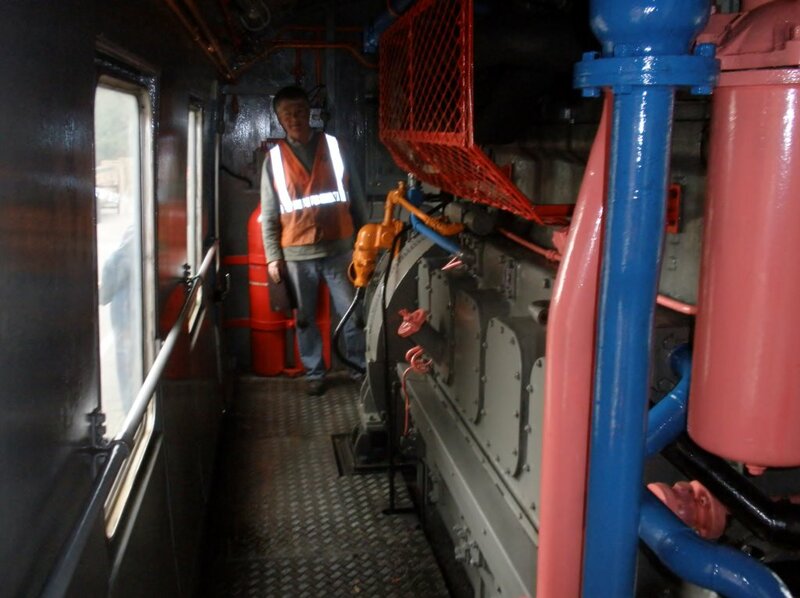 The cab is a good illustration of how difficult it is to restore the paint finish, with multiple pipes etc. running around the cab. The 08 Loco running round the Thumper at Ongar during the Diesel Gala. Some of the modifications can be seen on the Loco that allow to make trips in to Paddington. After some weeks with the team diverted to other duties, we are now coming to the final stage of the cab restoration of the class 37. We had a ‘big push’ this week to complete the odd jobs still outstanding. At one stage, four of us attempting to work on different jobs made for cramped working conditions in the cab! 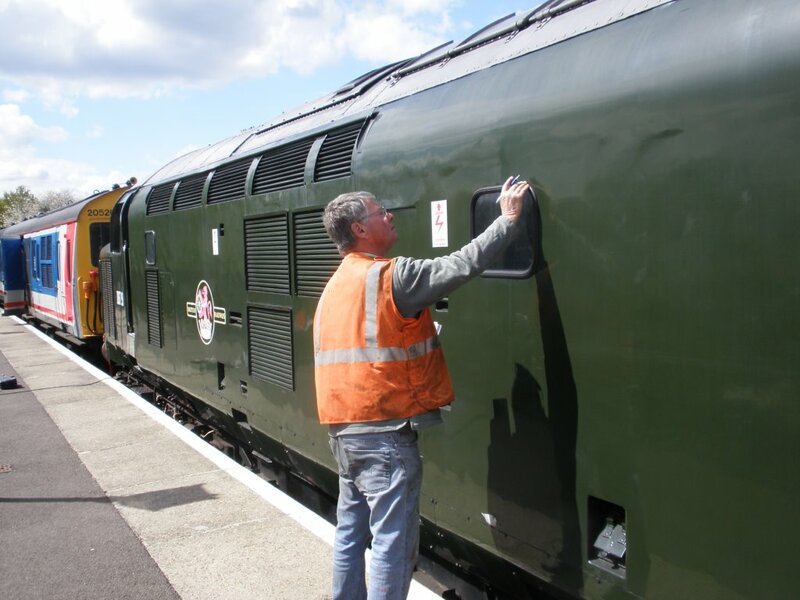 We have, for the most part, stopped spot rubbing down, after spotting odd paint blemishes, as they are ‘Historic’ paint blemishes that we had earlier left as part of the Loco’s history. I spent the morning making up and fitting the new draught proofing skirt around the driver’s desk, spending many hours hunting around for similar material (a type of black ‘Leather Cloth’) to that donated for use in number one cab. In the end I found a good match. Chris fitting the new draught- proof ‘skirt’ to number two driving cab. Mick spent most of the day finishing the straight lines between the green and cream on the rear bulk head covers, and then surveying the locomotive exterior. 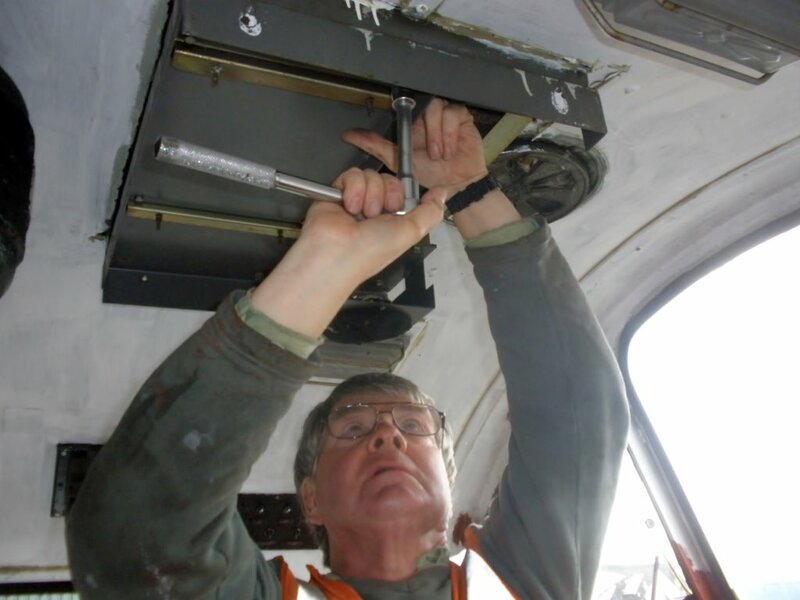 As the Loco is over fifty years old and the bulk head panels are off a later build loco, and have been modified (with a big hammer) to fit, you can’t measure or use a spirit level; Mick had to apply the masking tape in a very time consuming – manner by eye. Ken spent the day painting air and vacuum pipes white. Graham specialises in all the odd colours – such as orange pipe work, grey AWS, black Driver’s desks etc. Graham painting the AWS equipment grey. In this picture you can also see the repaired roof sections, refurbished crew seats, the refitted roof vent, and not forgetting, the cab’s complete repaint. A start was made in applying transfers. We have obtained a supply of replica engine room warning transfers, which date back to the introduction of diesel locomotives. The team have started to plan the next stage of the restoration – spot exterior repairs of the 37 bodywork. Graham and Mick have been surveying the work required; from their notes, it is clear the team will not be running out of work any time soon! Mick is now surveying the exterior bodywork, looking for areas in need of attention. Our external engineers have fabricated new head code boxes, (you may have noticed the change of head codes) and we now have full frontal lighting. I was impressed with the standard of the work and it’s a shame it is out of sight . For the most part, the recent work we carried out to seal the roof seems to be effective. Our very clean and polished Class 37, waiting in the sun for it’s next turn as part of a top and tail Epping Forest service. During the recent 150 year celebration gala, after a steam engine failed, the class 37 (which was standby loco) was pressed in to service as a replacement Locomotive. During the two day diesel gala, all the locos performed well, with the exception of 03170, which was top and tailing a three coach train with our other 03 loco. Suddenly, it decided to have a mind of its own, and operate the emergency brakes via the DSD system. This fault was later traced to a defective air valve within the DSD system. The two 03s on a top and tailed service at Epping Forest, our new limit of operations. The 31 is still in everyday use. Apart from receiving normal maintenance, she has operated without issue. To give you an idea of the scale of the diesel engine sumps on our English electric Locomotives, when I recently performed a service check on the 31, to top up the sump (which was not on minimum), I put in 14 full standard-gallon watering cans worth of sump oil. This Locomotive has been in ill health for some time. She is a very complex and much modified machine, and as fast as the team cleared one fault, another materialised. “Last year, 47635 would frequently fail to take traction power, and was lacking power when operating. 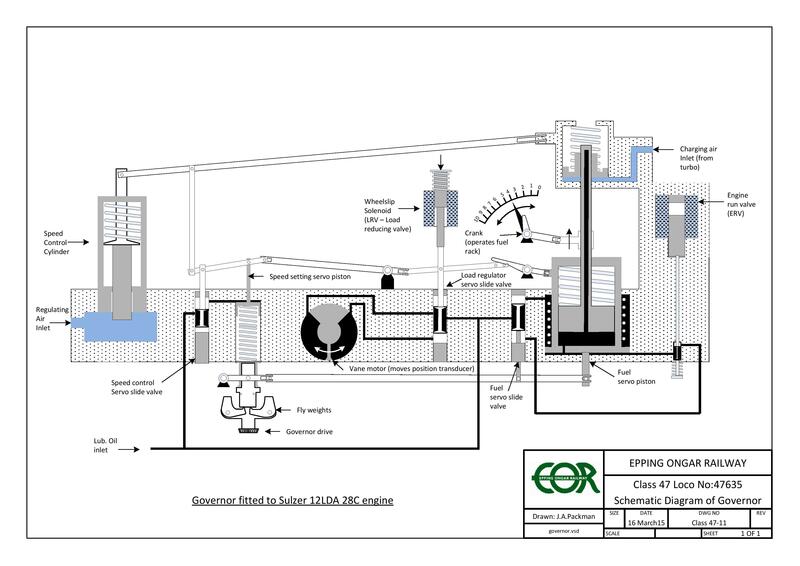 The Sulzer 12 cylinder engine has a mechanical governor, which does many things as can be seen in the attached diagram. The vane motor, that is shown on the diagram, controls the field of the main generator using a power module containing thyristors – a semiconductor device that converts AC to DC. Investigations indicated that the drive from the vane motor to variable transformer, which feeds the power module, was badly worn and had probably disengaged. This was easily fixed by reversing a pin. Problems persisted however, and 47635 failed towards the end of the Autumn Diesel Gala. Expert assistance was brought in, and it was found that the diaphragm in the speed control cylinder had failed. 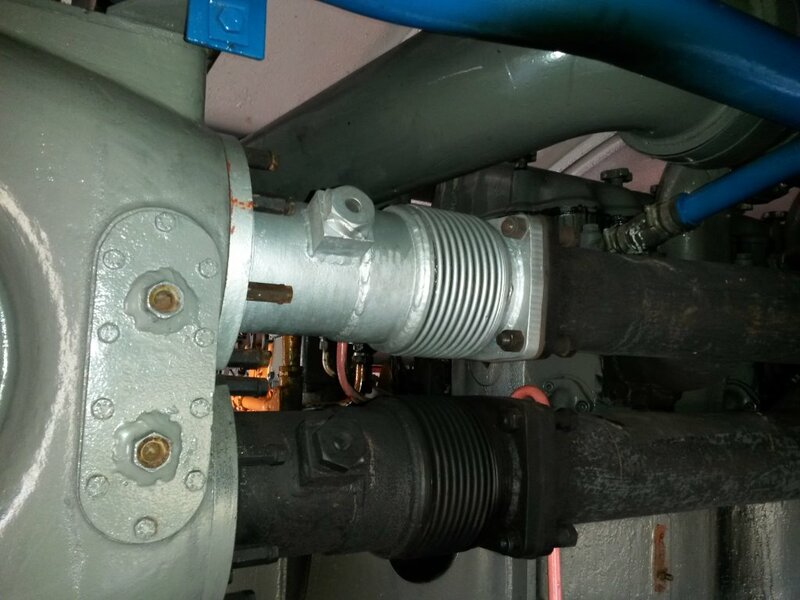 The speed control cylinder is an air cylinder operated by the driver’s power controller. The whole governor assembly had to be removed and sent away for repair. This was returned at the beginning of this year and refitted, but a number of additional problems were identified. The first problem was that the repaired governor would drive the vane motor round to the full load position on engine start up, preventing 47635 from moving (unless something was shorted out). The second problem was that metal was found in the engine lubricating oil due to a worn cam follower on the camshaft. The first problem was fixed by re-positioning a lever in the governor, and the second by replacing the cam follower. 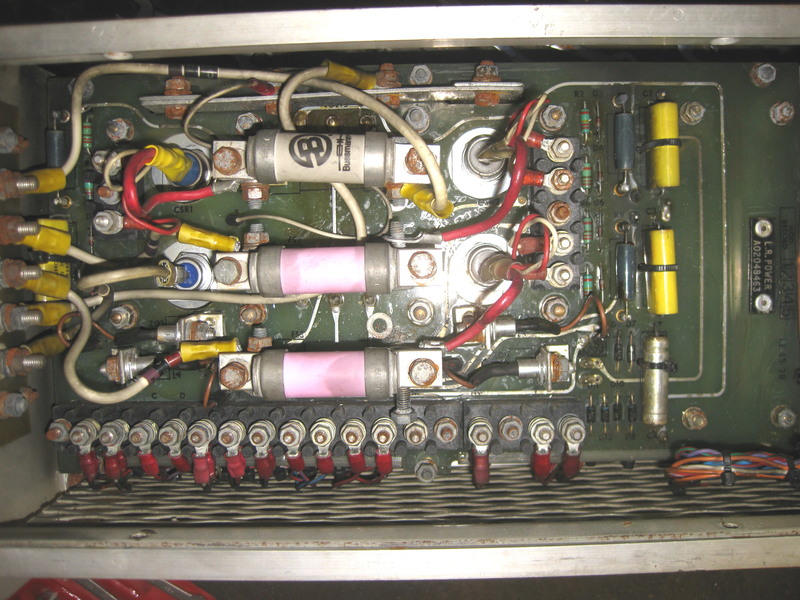 Lack of power remained a problem and this was eventually traced to a couple of faults within the thyristor power module, the inside of which is shown in the attached photo. 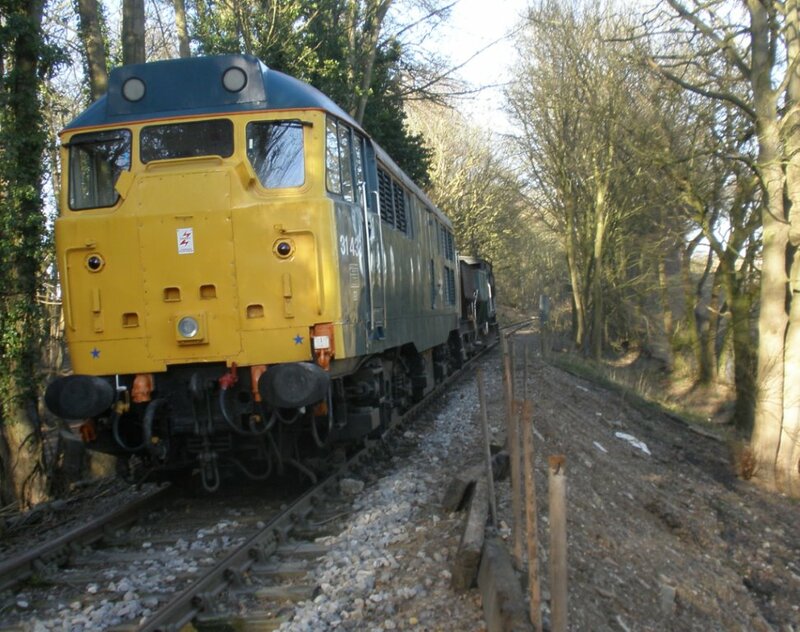 A module was borrowed and 47635 was finally fixed and performed well at the Spring Diesel Gala. We have now managed to repair the original power module ourselves and 47635 is now back in service using this module. Unfortunately a compressor motor has now failed, but she completed all her booked duties on the diesel gala without any further problems. This ‘thyristor’ power control module was cutting edge technology in 1975, when it was fitted to the locomotive as part of a modification. But in 2015, Jim had a hard search using the web to find the obsolete replacement components required. Jim’s diagram for the Class 47 governor. Work on this unit is progressing well, with the new internal roof of the baggage compartment in place, with the exception of the fillet pieces which will be fitted once the work on the walls is complete. 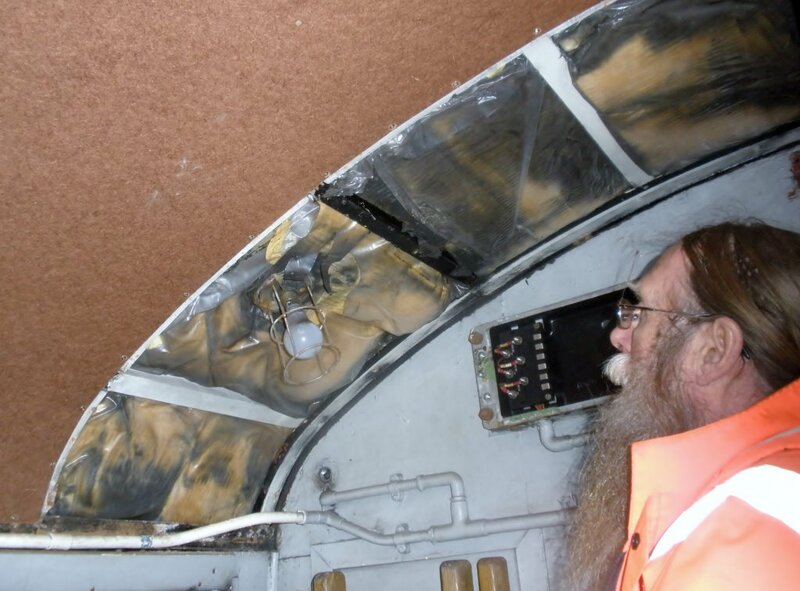 Michael Fisher, who is the lead on this job, is now in the process of removing and replacing the baggage compartment wall that makes up the wooden internal walls on the second man’s side of the power car. 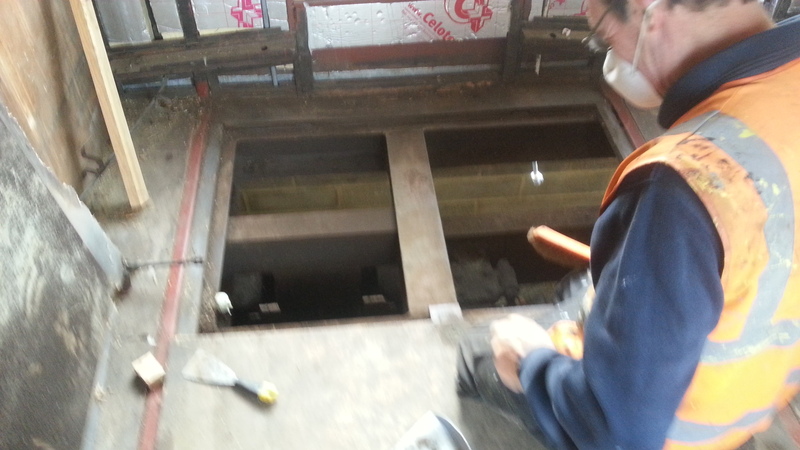 There was rot caused by a roof leaking over many years – this has been traced and sealed. The whole of the wooden wall required replaceming – including the metal sub-support structure. Michael start to methodically remove the old wooden plank walls. Our colleagues in the carriage and wagon group, who are our specialists in seating repairs, are making progress in replacing or repairing the Thumper’s passenger seats; the crew seats were reupholstered by Jan Ragg as part of our cab refurbishment. It is the intention to replace all the passenger upholstery with new Network Southeast pattern material, when funds become available. But (and it is a big ‘but’) because Network Southeast material is non-standard design, the cost is eye watering – double that of standard material! 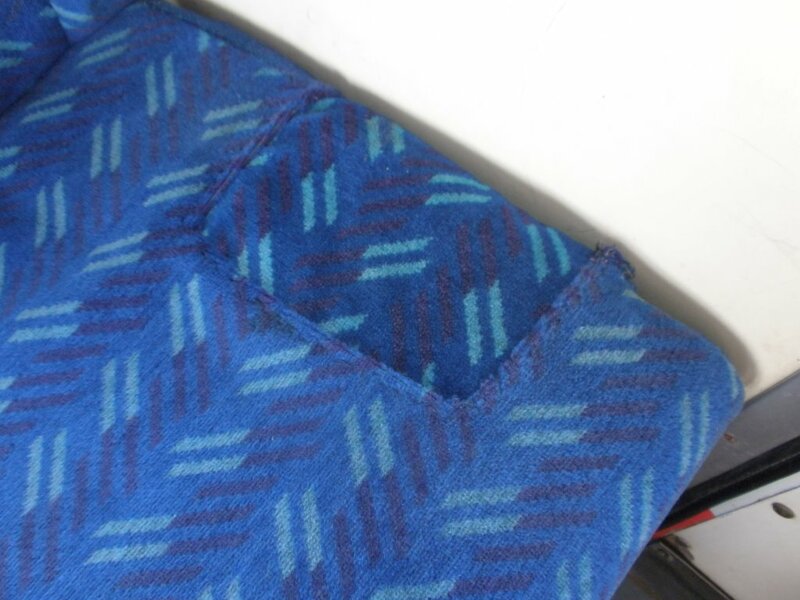 C & W department have a small stock of Network Southeast material, which they are using to recover the worst seats, then using any recoverable material to patch repair the other seating. If you are aware of a surplus stock of Network Southeast pattern material, please get in touch. 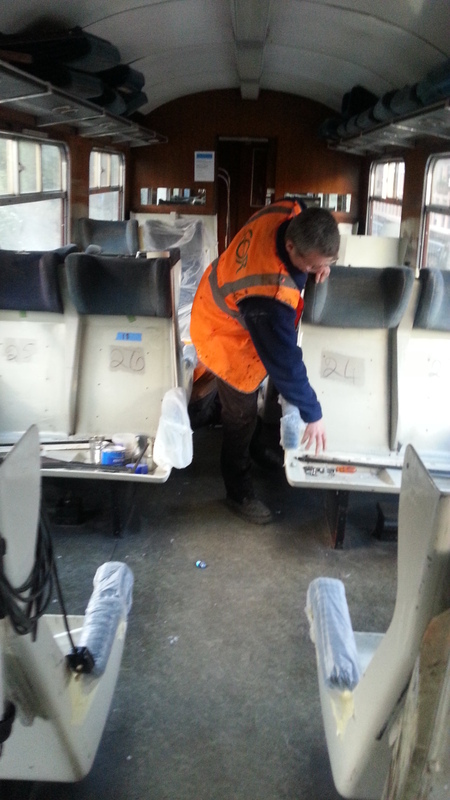 The C&W team are making spot repairs, utilising salvaged material from upholstery being replaced throughout the unit. On the Thumper Diesel engine front, recent exhaust bellows repairs have worked well. However, while I was driving the unit in service, I noticed a additional ‘Diesel Engine knock’ and called in the skilled engineers. The unit was briefly taken out of service, and the fault was traced to number one cylinder head tappet rocker. The rocker had accumulated extra wear allowing certain sideways movement. The engineers tell me that she is ok to run but will be monitored; another planned job on the heavy maintenance list when she is next stopped. I was asked, with the all the bangs and rattles that this type of English Electric ‘Thumper’ diesel engine normally makes, how did I know there was a fault? The truth is you just get used to the sound of the engine. and pick up on any unusual noises. As part of the winter shut down maintenance, a split exhaust bellows, located between the fixed exhaust pipe and the turbo charger, was changed by Michael and Neil. It was quite a big job but well planned and completed within a day. The new and old exhaust bellows. The engine exhaust, back in full working order. The locomotive’s Dynamo was found to be defective, and a decision was made to replace it with a more modern alternator. It was clear a fair amount of redesign, re wiring and fabrication of parts was required to fit the chosen high-output alternator on to a nineteen fifties design of Gardner diesel engine. At the same time, a new electronic rev counter was also to be fitted. A mock up wooden pattern was produced prior to fabricating to finished metal parts to check all fitted correctly. The new alternator output (which has a built rectifier and control unit) is almost three times that of the old dynamo. Doug, our own electrical design engineer, fits a wooden-pattern fixing kit for the new alternator. Based on this design, a new metal fixing kit will be fabricated. John, one of our highly skilled mechanical engineers, fits the new alternator with the fixing kit he fabricated. The Alternator has test wiring in place prior to complete rewiring of the charge circuit. Both our own and external engineering staff have spent many hours working on the complex load regulator system which was defective. The loco was being tested as I wrote this blog – the indications were good. The team seem to have gotten on top of the problem. We have made lots of progress, with many strands of work progressing. We have performed work to seal a leaking roof section above the battery box, remedial work on battery has taken place, new frontal light equipment is being fitted along with new wiring as well as other repairs. 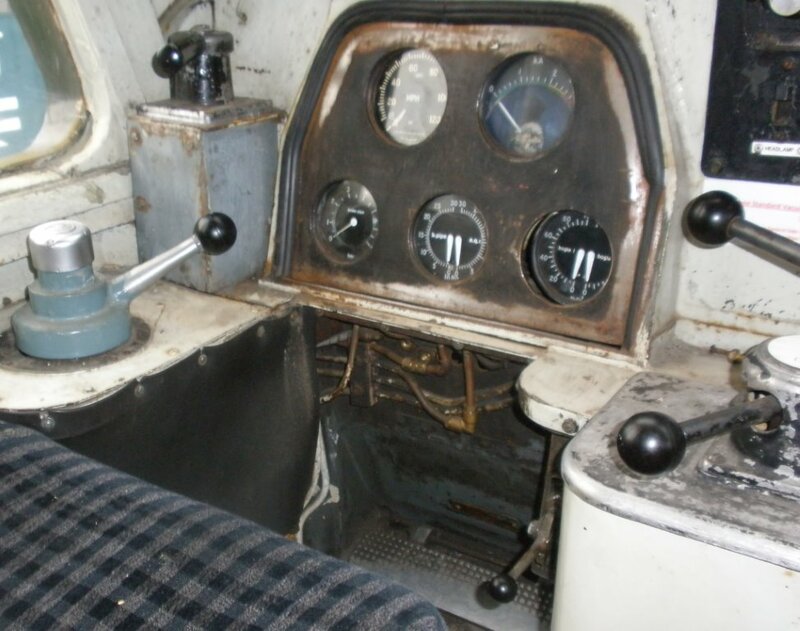 There was a major problem in number one cab, being the driver’s desk rubber-mounting strips perishing with age, allowing the desk to fall out of its mounting. This proved a very difficult job to not only repair, but source the replacement industrial glazing strip. After much hunting about, we managed to source the glazing strip and the special tool required to fit the rubber strip which holds the main strip in place. The glazing strip had to be specially ordered, thus proving to be rather expensive. The real problem came refitting the desk, with the air pipe and electrical connections that had to be partly dismantled to be able to twist the desk at an angle to allow the rubber strip in place. I was really struggling with this job. Luckily, one of our external engineers, Simon, and Michael Fisher – our own top engineer – were to hand, both having experience with this type of industrial glazing strip fitting. After a further two hours, lots of dismantling, brute force, and washing up liquid being applied to the glazing strip (as lubrication), accompanied by a lot of cursing, the final section of glazing strip went into place. Just the small task of refitting and adjusting the parts we removed from the desk and final checking of electrical and air connections, which all proved good. You will see from the photo, the desk, with its three coats of shiny black paint and the new draught proof skirting around the base of the desk, looks very smart. In fact, thanks to the teams hard work, the desk probably has not looked this smart since the loco was new. No.1 cab prior to refurbishment. 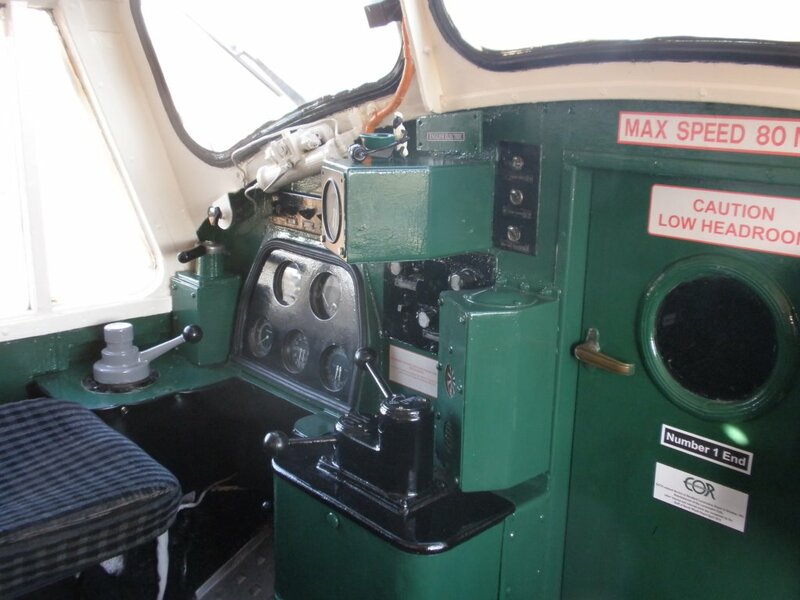 Completed No.1 cab, with new draught-proof skirting around the driver’s desk. The Class 31 has been a real workhorse during the close season, having been in almost daily use on engineering trains. With have put lots of resources in to work to upgrading the track as we get ready to extend our passenger service past Coopersale into Epping Forest. The 31 has also been in use on the vegetation clearance train. 31438 with an engineer’s train in the forest. This diary covers the period from the end of Christmas running, to the February 2015 half term. The rake-of-focus consisted of the Carmine and Cream BSO 9140, the MK1 TSO 4925, and the MK1 TSO E4809. The carriages each had different issues; the bulk of these were in the Carmine and Cream BSO. The upholstery was far beyond its best before date and looked scruffy. There were 2 leaking windows which also affected the condition of the wall panels below them; the luggage/bar area was also in poor condition, and the floor coverings in the 2 passenger vestibules and the luggage compartment corridor required replacement. 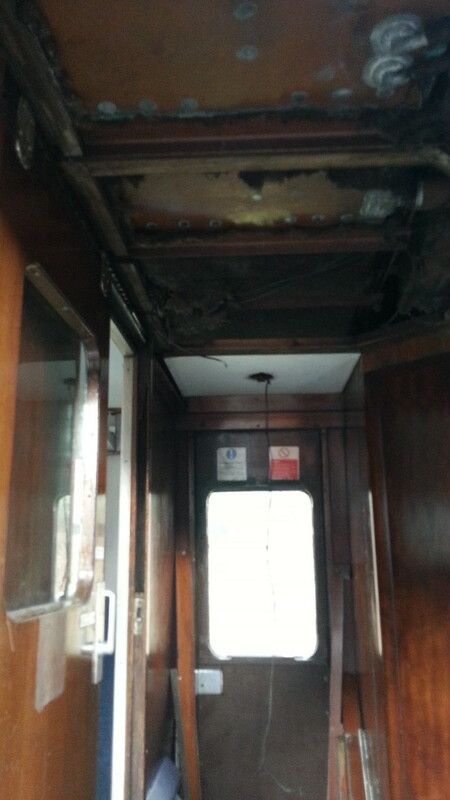 The MK1 TSO 4925 had suffered ingress of water into the Ongar end vestibule which had flooded the light fittings and collapsed the ceiling. The leak was sealed and the ceiling refitted. 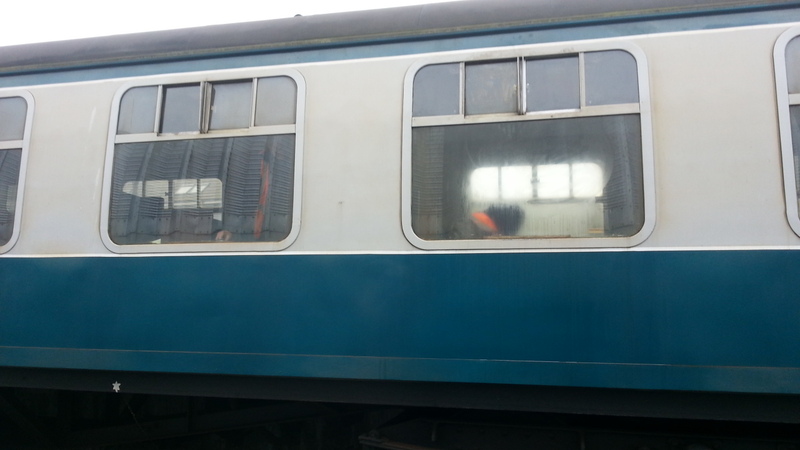 The MK1 TSO, E4809, had some broken glass in the sliding windows; the quarter lights either side of these were replaced. The contrast between the new upholstery on the left, with the dull, faded upholstery on the right. 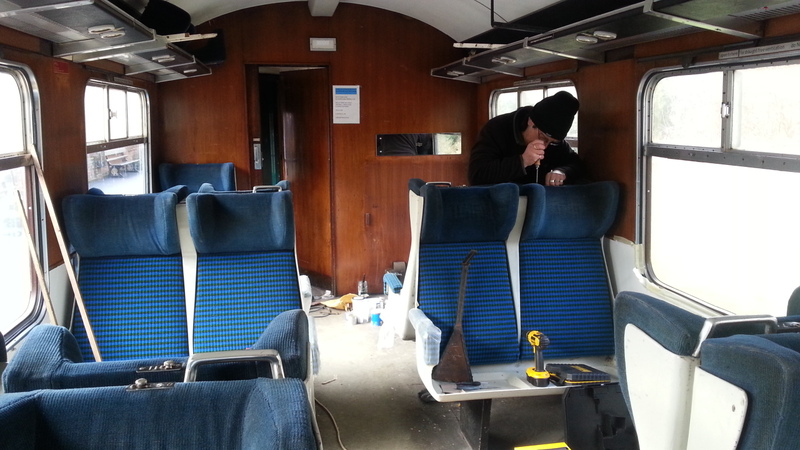 Preparation for the newly upholstered seats and backs to be fitted. Re-assembling the chairs after the newly upholstered seats had been fitted. Note the headrest have been dyed to improve their appearance. 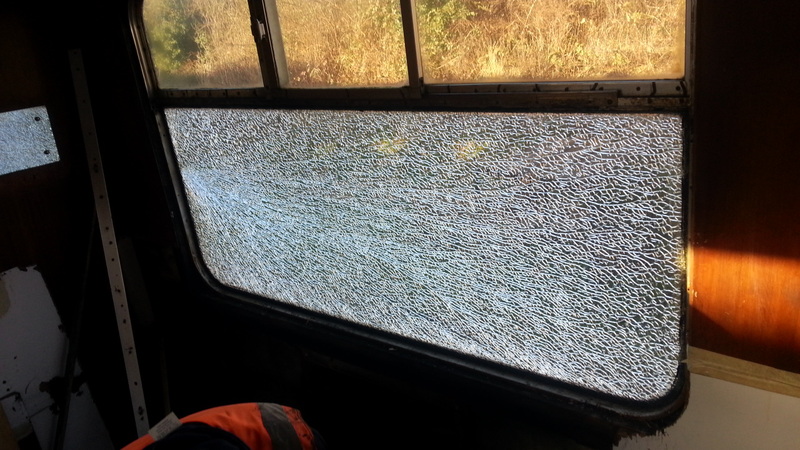 The 2 windows nearest the Epping end of the carriage were leaking, thus damaging the wall panels. 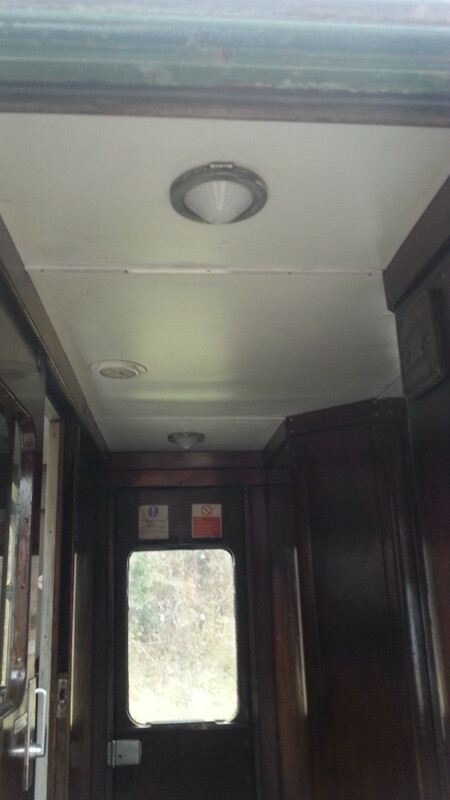 The windows are single glazed glass, which are non standard for this carriage. 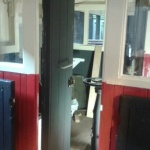 It was decided to fit the standard double glazed windows for these 2, and as time and finances permit, work through the carriage until all are replaced. A new double glazed window fitted. George and Colin sanding the luggage compartment. With the luggage compartment fully painted, the bar was stained and teak oiled. 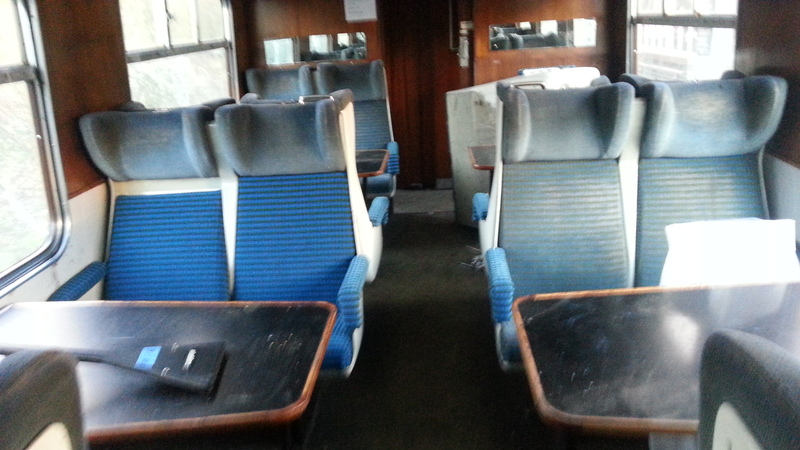 Compartment complete and companion seats fitted. A leak in the roof fabric lead to water ingress in the Ongar end vestibule. Unfortunately no images were taken, but the external leak was fixed. This image shows the removed ceiling and light fittings. The finished ceiling complete with lights refitted. 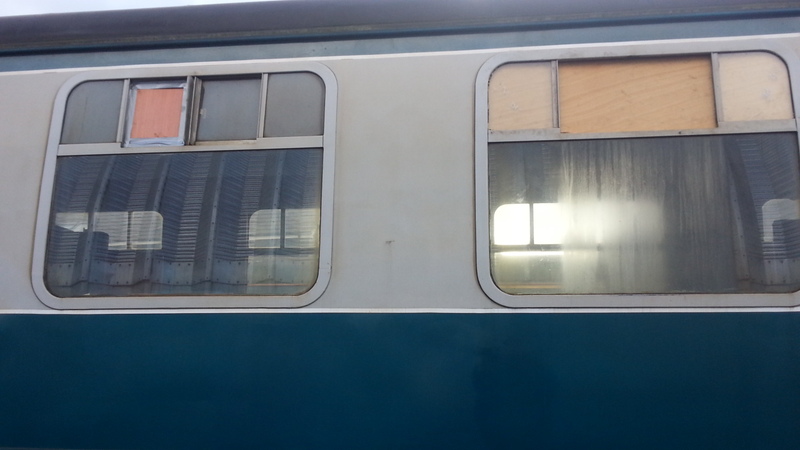 The damaged quarter-lights and sliding windows were removed, and panels fitted to protect against the weather. New sliding windows and quarter-lights fitted. Happy New Year to you all. Special thanks to everyone who has been following our blog for the past two years or so, and also to everyone who came up over Christmas and the New year – thanks for your support. 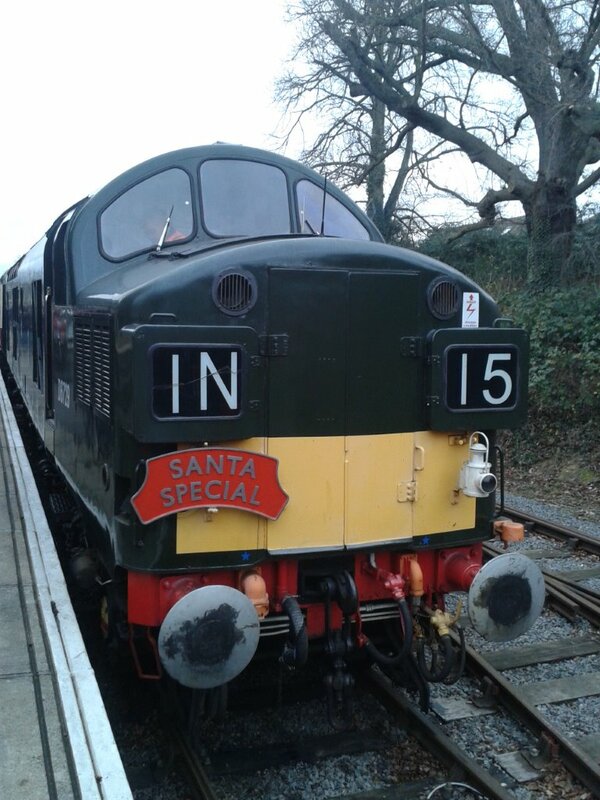 The real hero over Christmas and the new year workings was our Class 31 438 Locomotive. She worked all the Santa special and then the loco-hauled Mince Pie specials over the new year, with only one minor fault developing, that being number one end ETS supply monitoring bulb which blew on her last booked trip of the season. She worked at the Epping end of top and tailed trains, which for the most part is on the steep uphill 1 in 60 gradients. She was hauling five coaches, plus either the Prairie tank 4141 or, after the steam engine failed, 37029 (D6729), a total all-up weight of 370 tons whilst also supplying ETH to heat the train. She was running at full power for a good part of each journey. 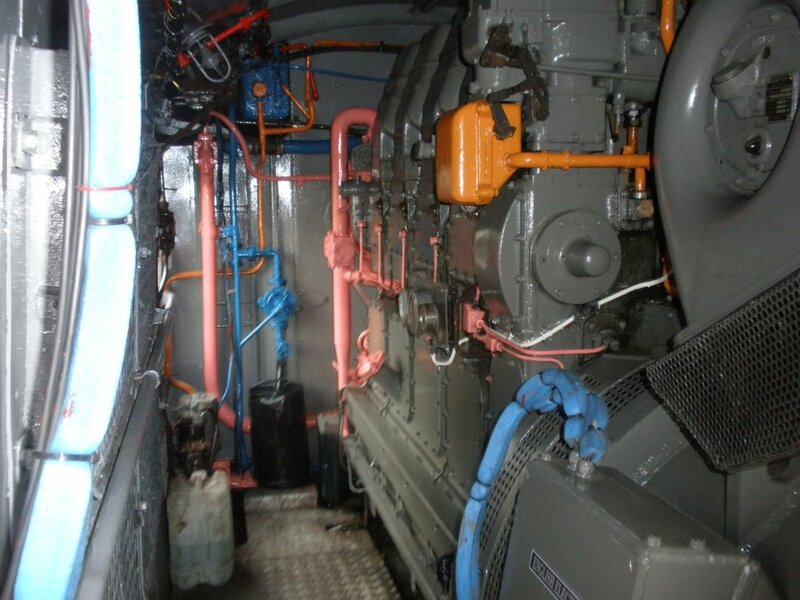 It used to be British Rail policy never to let the Diesel engines of main line locomotives get cold when shut down, the reason being that their diesel engines were extremely hard to start if the engine block became very cold. It also caused issues with some types of English Electric Engines throwing oil out of the exhaust. When I worked at Stratford, I was booked on duty on a number of Christmas’, solely to start all the engines of the locomotives on the depot and let them run for a couple of hours, then shut them down again. In the month of December the 31 engine block never had the chance to get cold,it started at the touch of the button and ran sweetly, like she was back on the main line. Clearly, all the contacts and relays also befitted from being in constant use, warm and dry. Her exhaust was clean and no oil was getting by the oil control rings. I believe the reliability of the 31 reflects the excellent work performed by the engineers of both the mid Norfolk railway, our own Epping Ongar railway, and the restoration team in the high quality of the rebuilding of the Diesel Engine and restoration of the locomotive from scrap condition carried out over recent years. Our standby engine, the class 37 029, was also pressed in to service, when part of the rocking grate of 4141 broke as she was shunting out of the shed for her days duties, immediately before Christmas. 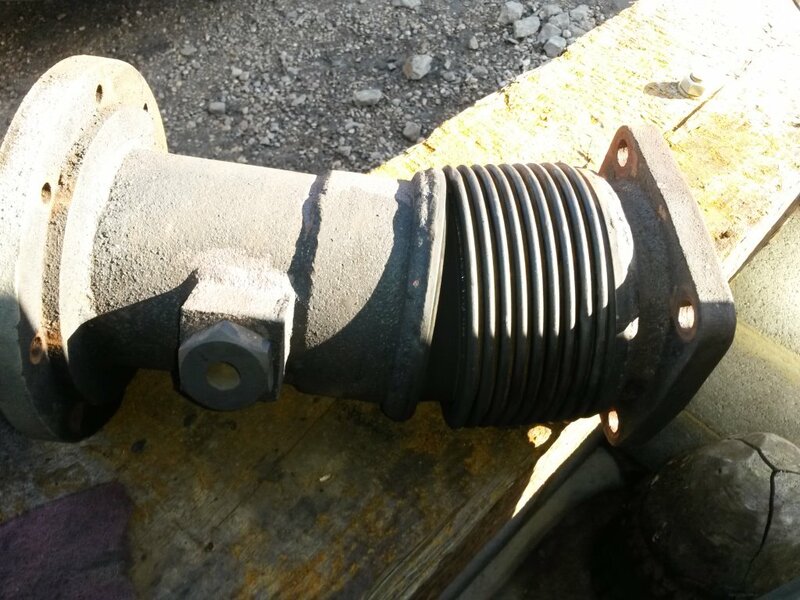 A fairly straightforward repair for our skilled steam engineers – if you have the parts to hand, sadly we had to order them in. I drove a number of Santa Specials and Mince Pie trains, and I also helped with some of the many jobs required to operate these special services. I was just a very small cog in the small army of volunteers it takes to run these trains in an efficient manner. 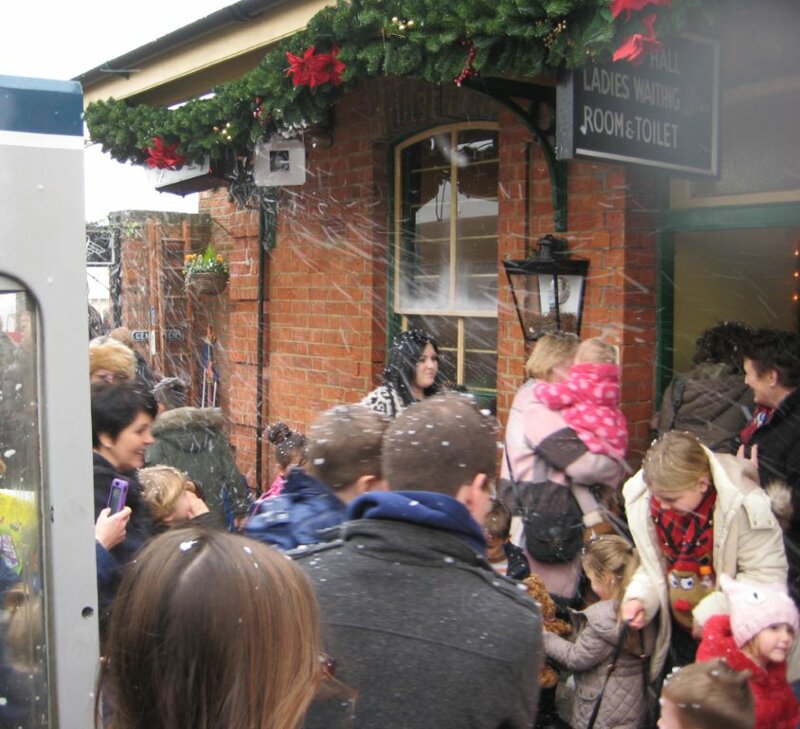 It proved to be a very enjoyable experience – I personally loved the snow machines on North Weald Platform. If you were very good, you could get your picture taken with Santa in a real (well, sort of) snow storm. The last loco-hauled service of the season arrives at North Weald, with the signalman ready to take the token. A six year old girl put me in my place. She told me she was very excited as she had been ‘very good ‘and she hoped Santa would bring her a nice present (confirmed by mum). I told her I was also very excited as Santa had told me’ if I was also very good when driving the train I might also get a present’. She replied ‘I should not be so silly, old people don’t get presents from Santa’. The passengers disembark from the Santa Special at NW, braving the ‘Snow Storm machine’. 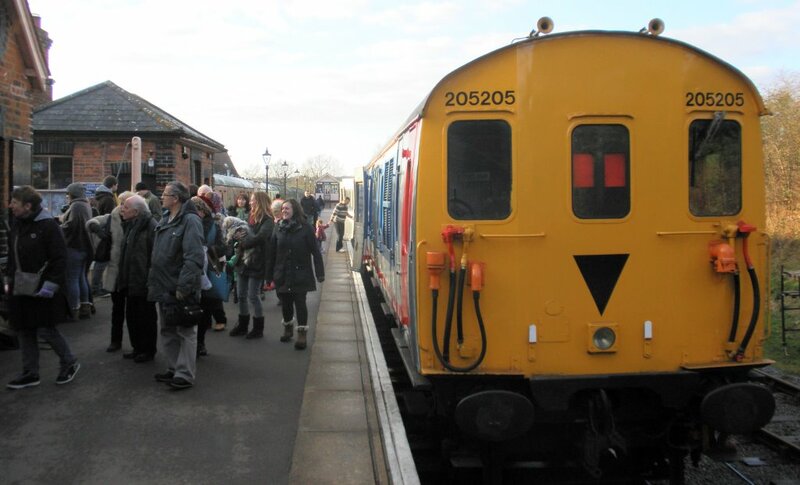 Even the local deer joined in the spirit of Christmas, with many spotted throughout the Santa season – on one day, a large group was seen in the field behind the North Weald Signal Box. Most of the team were diverted to other duties over the Christmas period with the 37 as the standby locomotive, however we are now back and hard at work. The time off has given us a chance to obtain some of the spare parts for various repairs. Number one and two cabs have been rubbed down and certain repairs have been completed; number one has been primed (as required) then undercoated. It has been rubbed down again then received the first top coat of green, up to waist level, and cream ceiling etc. More spot rubbing down will be required then further to coats will be applied. 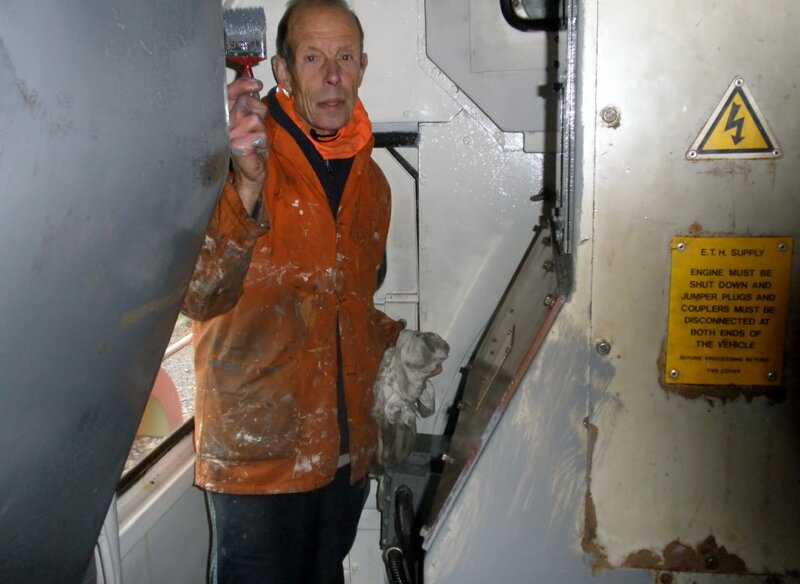 Graham applying the first of the Green Top coats in Number one cab of the Class 37. This top coat will be rubbed down once hardened. The 37 cab has proved to be very difficult to sand down, due to the amount of conduit and other pipework fitted around the cab. There are also hard mounting fixing points for additional safety equipment, fitted later in her working life, which were then taken off when the Loco was removed from the main line. It reminds me of the famous Lloyds inside-out building in London, where all the pipes and services are on the outside or surface mounted. It has been hard to get our fingers in to many places to sand, let alone a small mouse sander. Mick applies the first green top coat. You can see by his expression and his jumper, Mick has been struggling to get to some of the very awkward places in a Class 37 cab. The first top coat of Cream and Green paint. The top coat will be checked in different lights, and spot rubbed down as required. New ‘1960s Period’ transfers – and a few modern examples – are being obtained. The modern transfers are to comply with today’s health and safety requirements. Repairs to the cab seats have now been completed by the very skilled Jan Ragg; as Eric Morecombe used to say ‘You can’t see the joints’! Fantastic job. 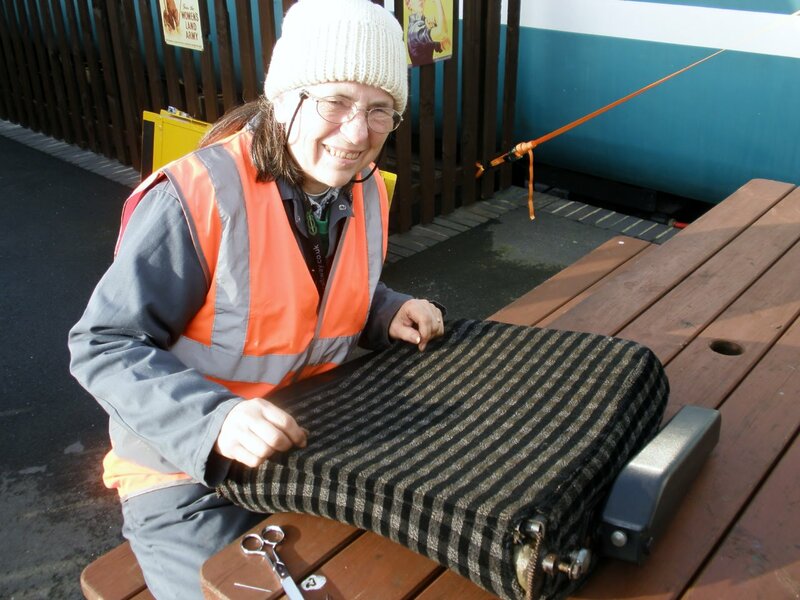 The highly-skilled Jan Rag completing ‘invisible repairs’ to the class 37 Cab seats, using scrap material recovered from the Thumper’s driver’s seats. There is still a very long way to go with the cab and other work required as a part of the class 37 restoration project, but we can now see some real progress. Our class 47 is still stopped awaiting spares. The side rods have now all been re-fitted with new bearings, and she is back in service on light duties, running-in the bearings. She is shortly to be released back to full traffic. Performing sterling duty as the depot pilot at NW. 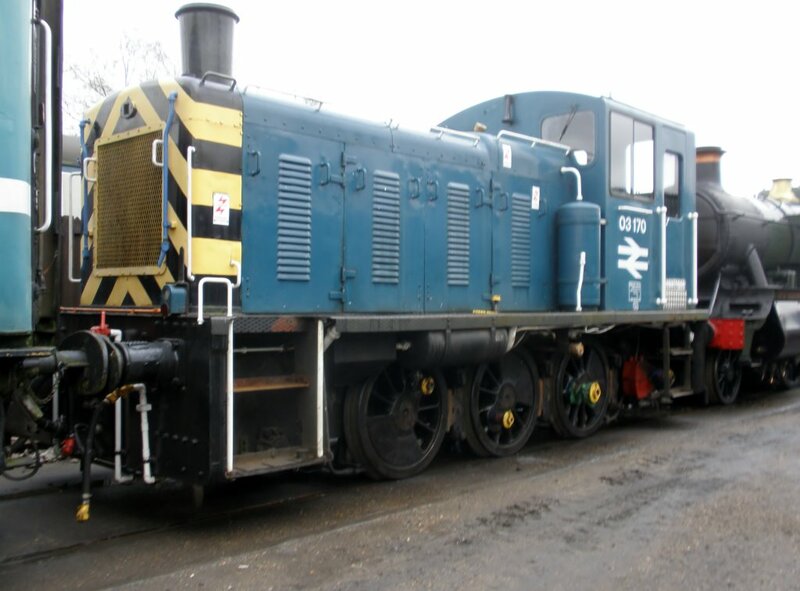 She has now completed 2014 season with the highest mileage of any of our traction units. We have found some more leaks in the roof which have been sealed. Work continues on the internal roof of the baggage compartment in between other jobs. The Thumper hard at work at the end of the season – looks like everyone’s off for a mince pie. There are a number of jobs scheduled on the Thumper diesel engine during the shut-down period. 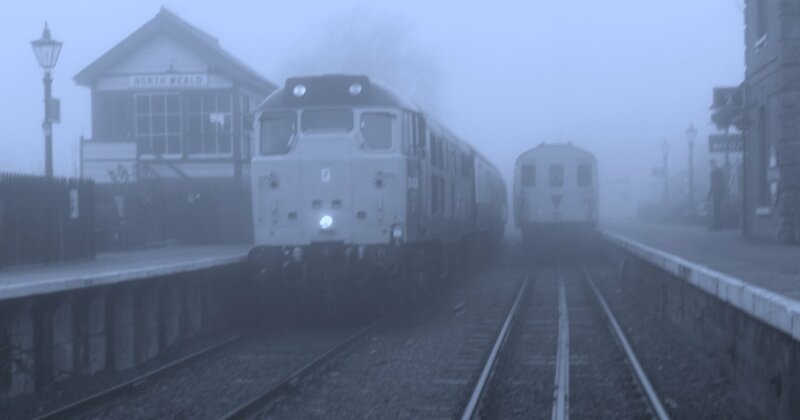 This may look like a scene from 35 years ago, but it was, in fact, the last operating day of the season – January 15 – which saw the trains being prepared for service in freezing fog. At Ongar, we have agreed a snagging list, that will keep us busy before we reopen fully next April. There is a lot to be done, including work on the Station building, the outbuildings, Signal Box and gates etc. One major job will be to put tiles around the urinal, sink and inside the closet of the Gents’ toilet, to make the area more hygienic – and ‘prettier.’ We have made a start by painting the rafters, and tidying up some of the paintwork. The weighbridge has had the lettering repainted white, and soon the rest of it will be painted in black. 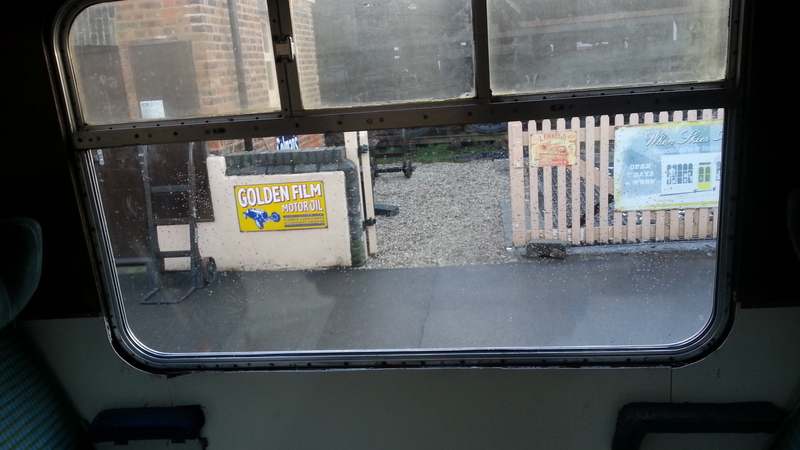 Each week, we clean the floors and windows of the Station: where does all the dirt come from?! 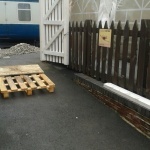 This ensures we have a presentable Station for the following weekend, and we carry out running repairs, as required. For Hallowe’en, we decorated the Station and the marquee, which housed the face painter, pumpkin carving, apple bobbing and blood and vomit soup, and created the Gruesome Graveyard. There was a lot to do, and we were fortunate that members of other departments assisted us. The C&W team painted the Finnish Loco matt black but kept the ‘Rest in Pieces’ slogan that was written on it, until after the event. 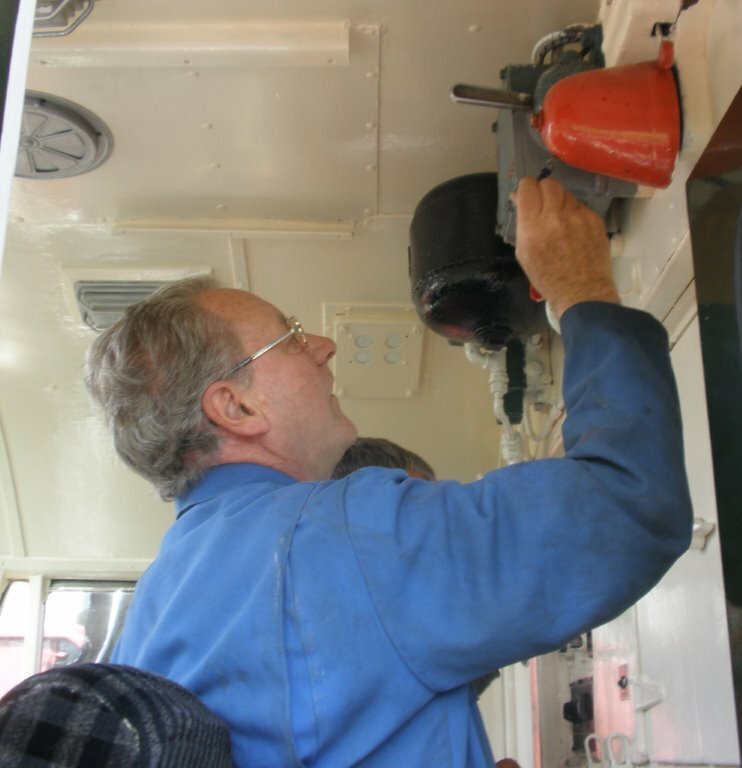 Moving to North Weald, the main project is the rebuild of the ‘Shark’ Brake Van DB993859; this is led by John Wilson. We have finished all the major jobs and only have the upholstering of the seats to finish, before the eighteen-month restoration is completed by the fitting of a cloth roof over the tongue & groove planks. The outside has had three coats of Matt Black; the inside is in Cream and Salsa Red with the underframe and plough in Gloss Black. 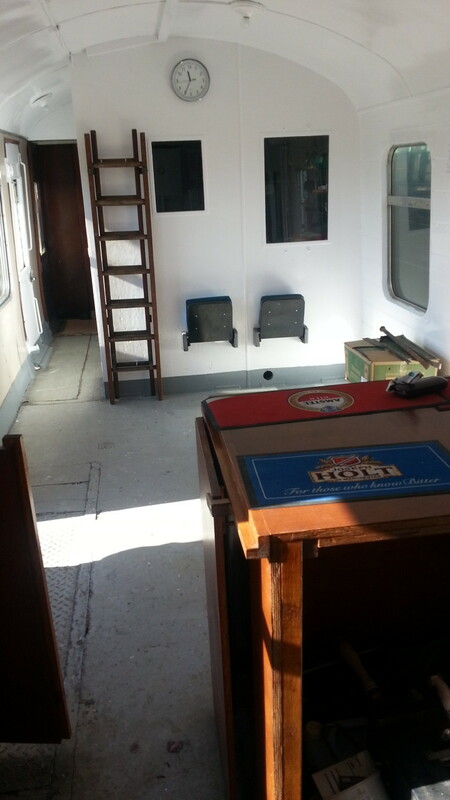 John has built new seating inside the internal cabin (we reckon six people can now sit inside), a guard’s desk and a top for lamps. 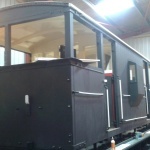 Originally, we hoped to have the Shark ready for the November 15th Photo Shoot; unfortunately, the roof is not finished, but we are confident that it will be in use for next season, giving Brake Van rides. We have calculated that we could squeeze a total of up to 20 people inside and on the veranda outside. 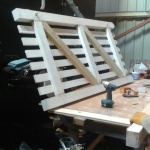 Bob Watkins has made a new window frame for the Signal Box, which is now installed. We will start the rubbing down on most of the other window frames and painting, and will also work on the floors of the Signal Box, Booking Hall and Ticket Office. This involves sanding and sealing them to cut down on the dust. 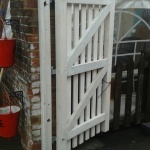 At present, Bob is building a set of large gates for the gap between the Gents’ toilet and the Anglia Café Coach area, using the same design of those that were there 100 years ago. We have started the long job of ‘Cuprinoling’ all wooden fences, and soon we will start repainting the white lines on all platform edges (at least, when the weather allows.) We continue to clean the Anglia Café Coach and the Station building each week, and carry out smaller restoration/repair tasks, as required. The EORVS has donated one of the North Weald GER benches, (which we stripped down and repainted), to the North Weald Mums, who have a new Children’s Playground at the back of the Village Hall. Plenty of work is pencilled in for 2015 so if you would like to help, do please join the society and get in touch. 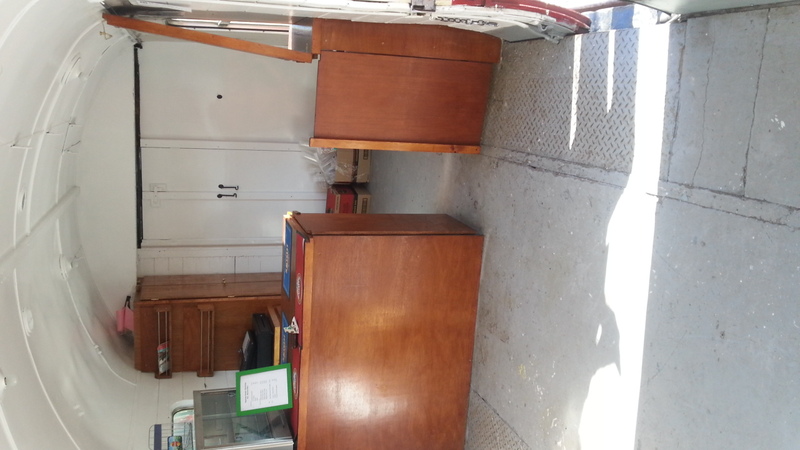 For the 2015 season we will (I hope) have an additional EOR/EORVS Gift Shop situated in the Portacabin at North Weald, which will require staffing every day we are open. 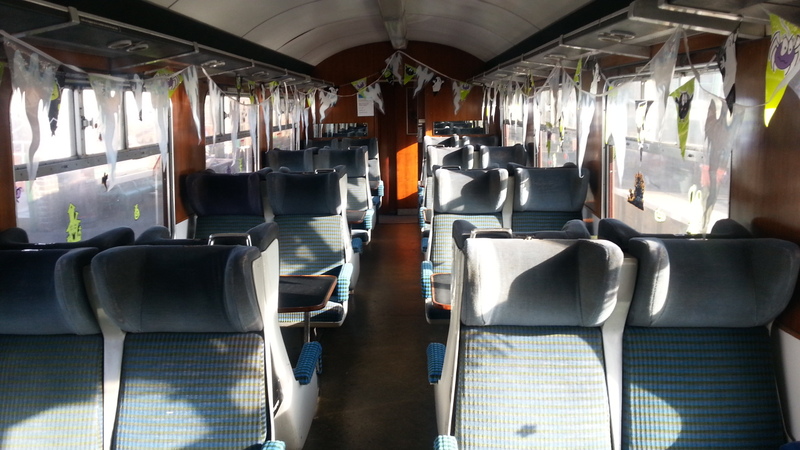 We also hope to be able to sell refreshments, including alcohol, on more trains throughout the season. With an additional shop and more onboard catering, we need more volunteers to come forward and assist us in ensuring we can adequately cover these outlets, which provide valuable income for the Railway and the EORVS. You will be given full training , which is not onerous, for any roles you choose to help out with. The Thumper being restored to a high standard. With its Network SouthEast paint work, fully functioning heating, lighting and public address system, it is proving to be a big attraction for visitors. Last Saturday (November 15), the train – feeling warm and cosy – was completely full on leaving Ongar, in effect recreating rush hour in the Essex countryside! 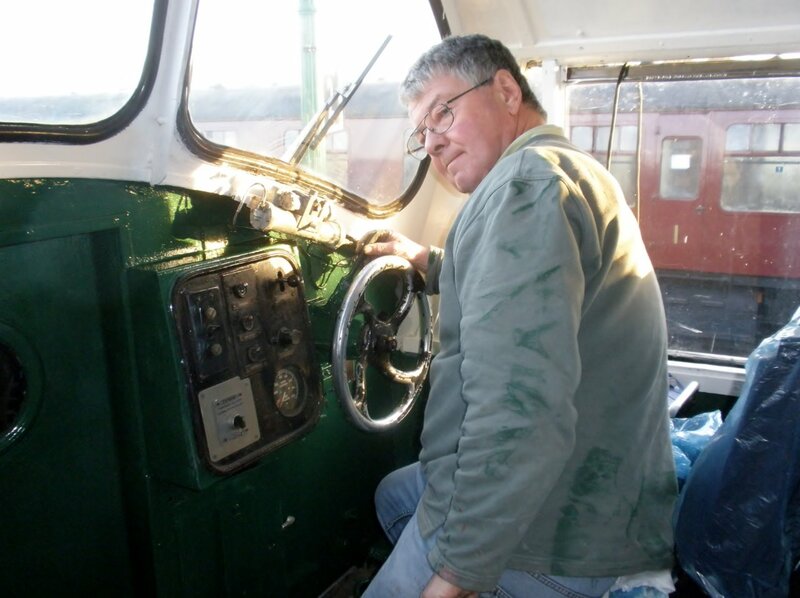 The cab rides (£5.00 per – person see the Driver) and the engine room tours (free to our passengers – again, see the Driver) are both proving very popular. Thanks to everyone who has come up and taken an interest in the Thumper. After a year’s work, the engine room refurbishment of the unit has been completed. The team have done an unbelievable job, but I will let the pictures speak for themselves. A big well done to Mick and his team of volunteers. Inside the engine room before work began. The completed work, after many months hard graft. A very proud Mick, team leader, in the completed engine room. 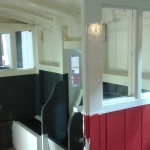 After many, many hours of work (and considerable expenditure,) the team has also now completed refurbishment work on both Driving cabs, the Driving trailer vestibule and the Guards compartment. 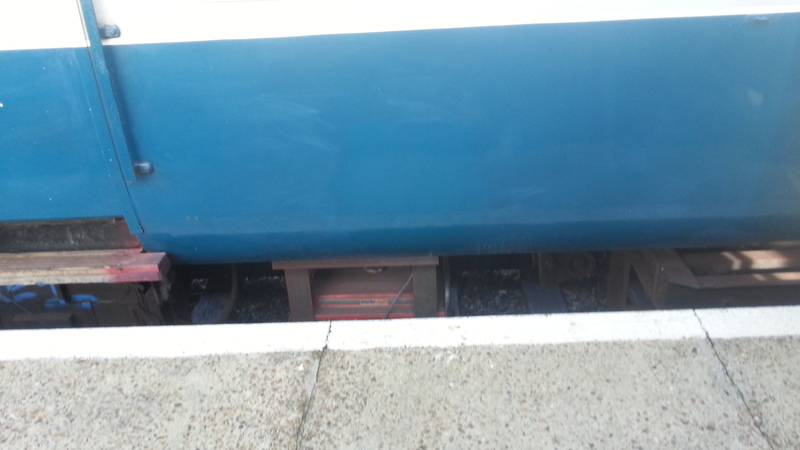 The external roof of the luggage compartment has been repaired. Now that the rain has stopped penetrating the roof, Michael (our skilled engineer) has started work replacing the internal celling panels. Another long job due to some of the complex panel cut-outs required. Michael at work inside the Thumper’s luggage compartment. After the roof has been repaired, the rotten wooden wall panels will be replaced, and a number of smaller jobs completed. 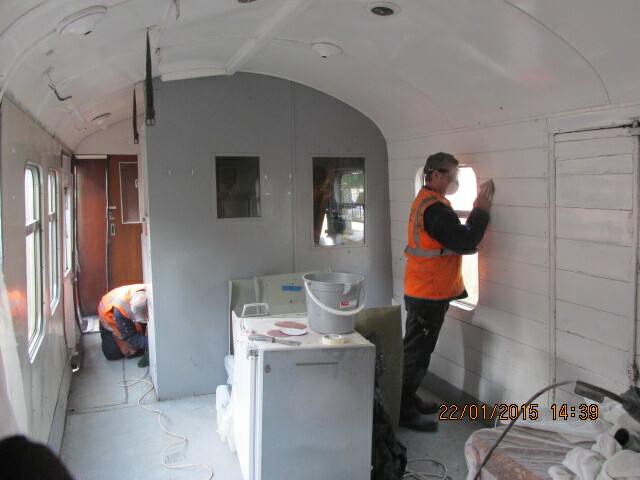 The whole of the Baggage compartment will then be repainted in the appropriate grey with white roof. It is intended to replace all of the upholstery with the correct Network SouthEast pattern material in the passenger compartment, and carry out a number of small jobs once the required substantial funds have become available. Of all of our rolling stock, the Thumper covers the highest passenger mileage by far, and has proved very reliable since the completion of the remedial electrical work in May. She will still be keeping our engineers busy in the quiet period after New Year, with their to do list of preventative maintenance once we source the required parts. With old trains, obtaining replacement parts is always difficult and can prove expensive – especially if the old parts have to be re-manufactured. 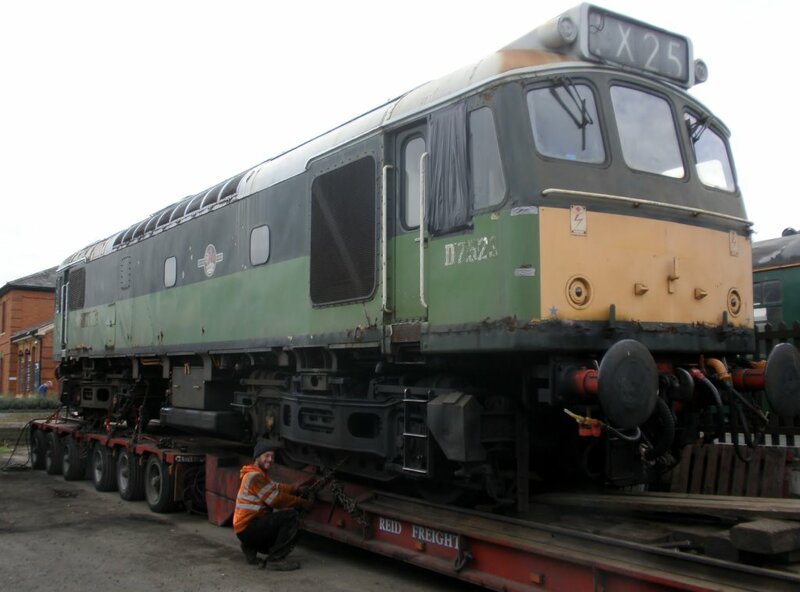 The team has started work on our class 37 locomotive, bringing the cabs, which have been untouched since the loco was withdrawn from the main line service by DRS – up to a similar standard to the refurbished cabs of the Class 31, 03 locomotives and the Thumper. 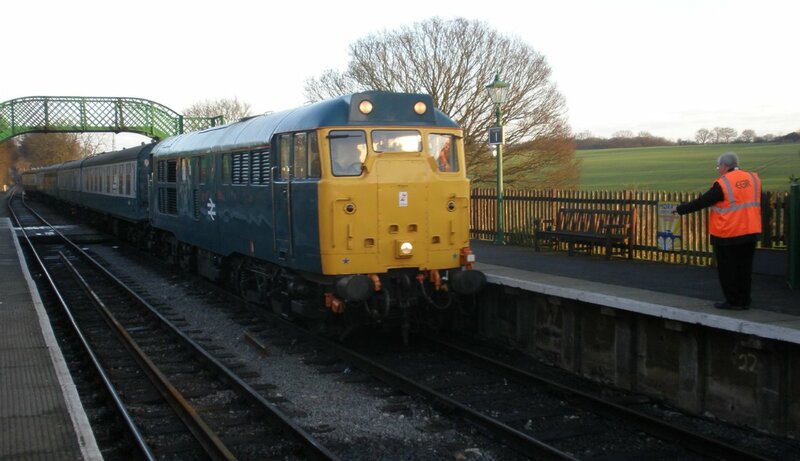 Many of you will be aware that our class 37 was rebuilt in the early 1980s as a heavy freight engine. She was re-geared to a lower speed of 80mph (pulling much heavier trains at this lower speed), the boiler was removed and the water tank converted to long range diesel tank, holding a total 1800 gallons of diesel fuel. The external body was also modified and, at an earlier date, she was converted to a dual braking system. She was later also fitted with the modern main line requirements, such as data recorders and radios etc. From the restoration teams point of view, the big dilemma with the Class 37 Locomotive is, it has been repainted externally as a she would have looked when it came in to service in October 1961 as a mixed traffic engine, in BR green body with a grey roof. 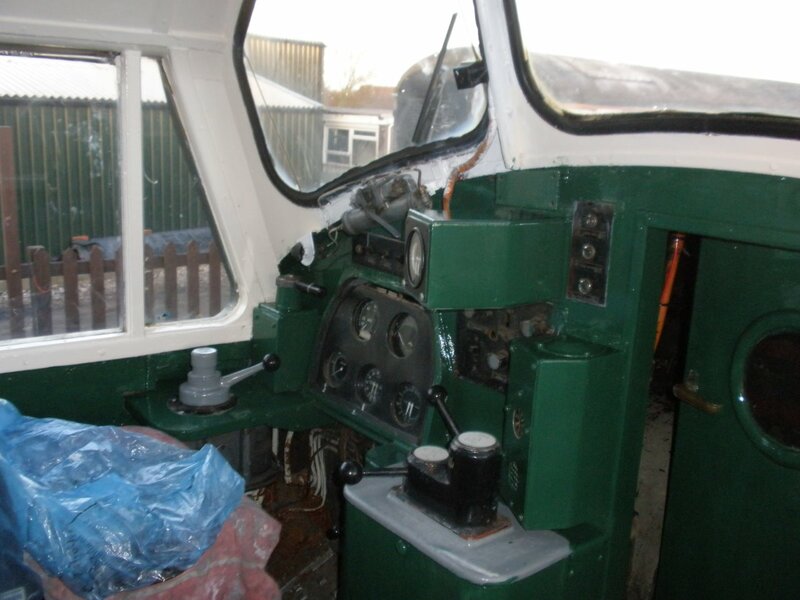 If we refurbish the cabs to match the external 1960s paintwork, she should be finished in Green and cream. In our refurbishment work, the team has abided to the principal of completing the loco/unit to the correct colour scheme and transfers for its body type/equipment. However, as a BR heavy freight class 37, the cab should be refurbished in grey and cream, but this would be out of place with the external colour. The feeling, however, is we should carry on with the 1960 theme and finish the cab in these colours. Remedial work have started in both cabs – lots of rubbing down, spot repairs being carried out, a base coat of red oxide applied as required and a undercoat of white applied in number one cab. The white undercoat gives us a base to work off. 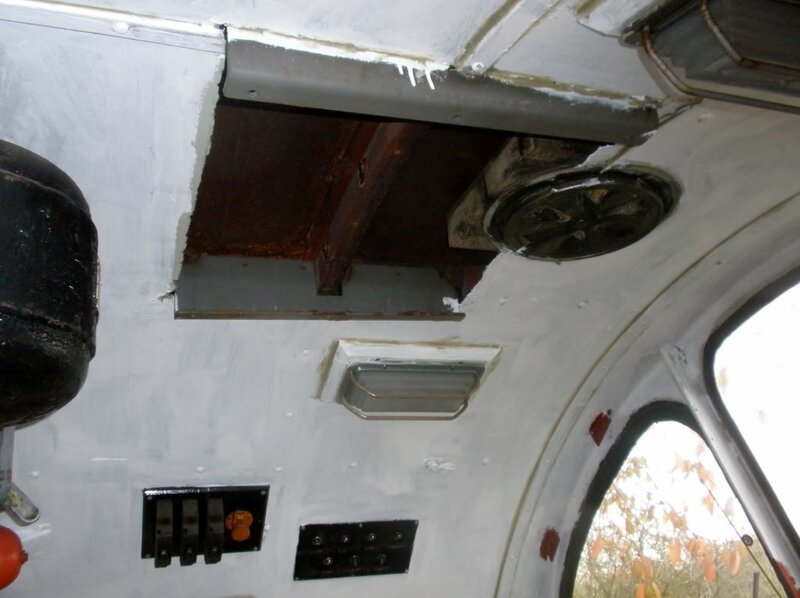 The now empty Radio housing cabinets have been removed from the cab ceilings, leaving a very large hole to be repaired; the radio – and a lot of other equipment – was stripped for reuse on other DRS locos when our 37 was withdrawn from the main line. Work begins inside the cabs of the class 37. Mick removes the redundant radio equipment housing unit. With the radio housing removed , we have to work out the best method of remaking the roof lining. The roof mounted ventilators were also removed for repair. There is a great deal of work to complete. The “TO DO” list just keeps growing as we get into the job; it’s a case of the more we do, the more we find that needs doing. At present the Class 47 is stopped, awaiting engine parts. The Engineers have working hard to trace an electrical fault which was causing a starting issue. Like many of these, there was more than one fault that, when combined, prevented the loco from starting. This was traced to switch gear contacts that needed cleaning, and a defective cell in the batteries. The loco is now back in full working order as the North Weald Depot pilot engine. The re-manufacturing of the side rod bearings is progressing well. The bearings are actually being cast and machined, then cold pressed into the side rods in our in our own workshops. 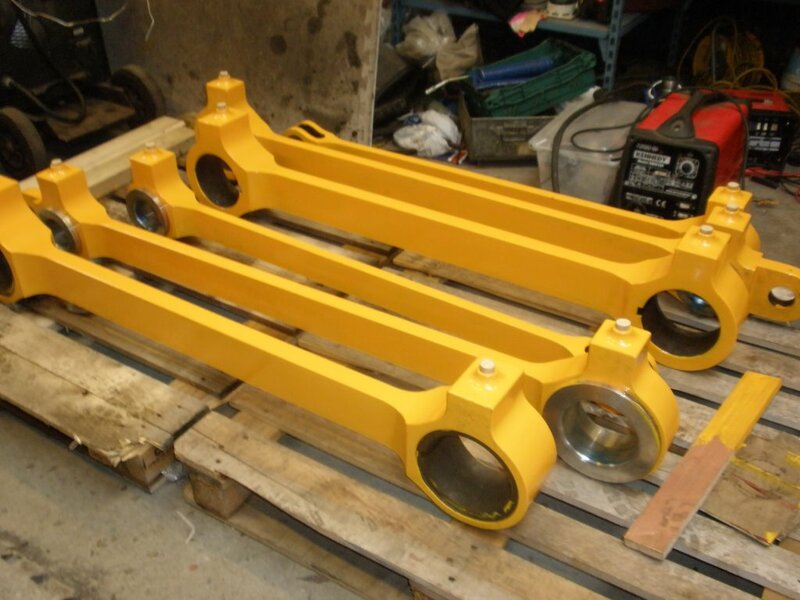 The repainted side rods, with the new “in-house” made bearings pressed into place. 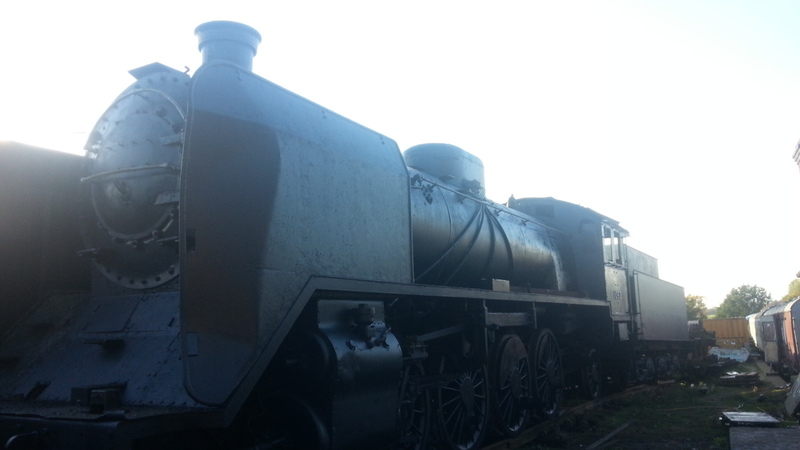 03170 patiently awaiting the refitting of its rods. This loco is proving reliable and is in much demand, being fitted with electrical train heat supply. 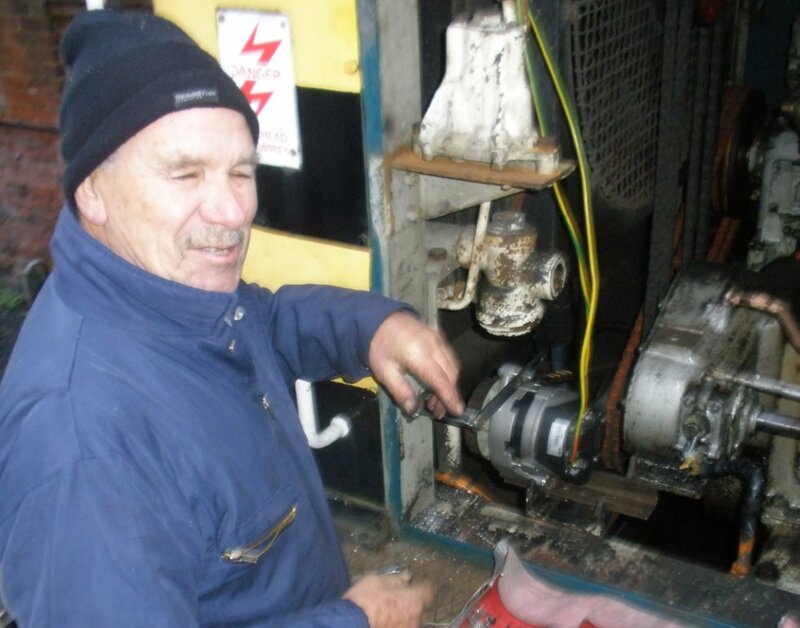 Dave has been cleaning and painting around the alternator in the engine room. She was in use this last Saturday (November 15) along with the class 37 for a night photo shoot. She was also the stand-by by engine for the Halloween specials, which were a huge success. Dave back at work in the 31’s engine room. 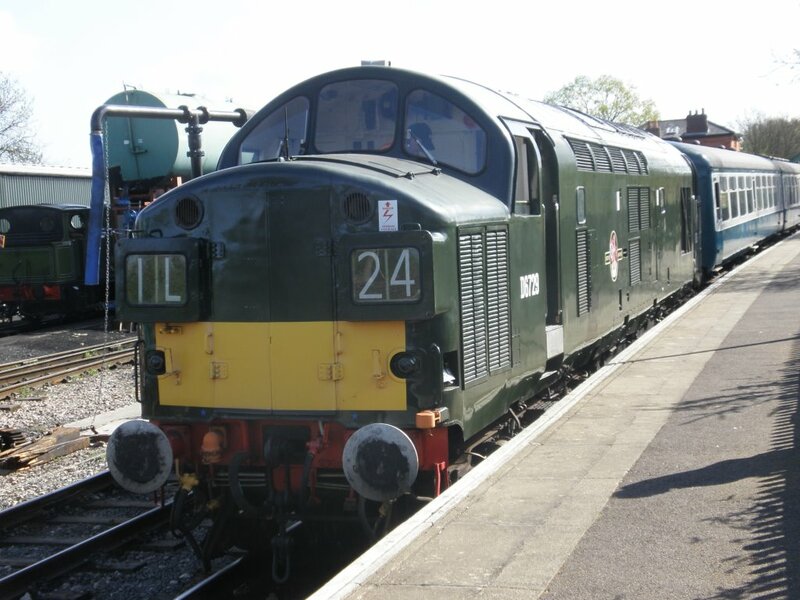 The class 25 had one last outing on October 11, replacing the class 33 on “Southern Saturday.” Despite being out of traffic for some time, after a quick service she performed without fault. She has now departed for her long awaited bodywork rebuild, and a long list of other remedial mechanical work. 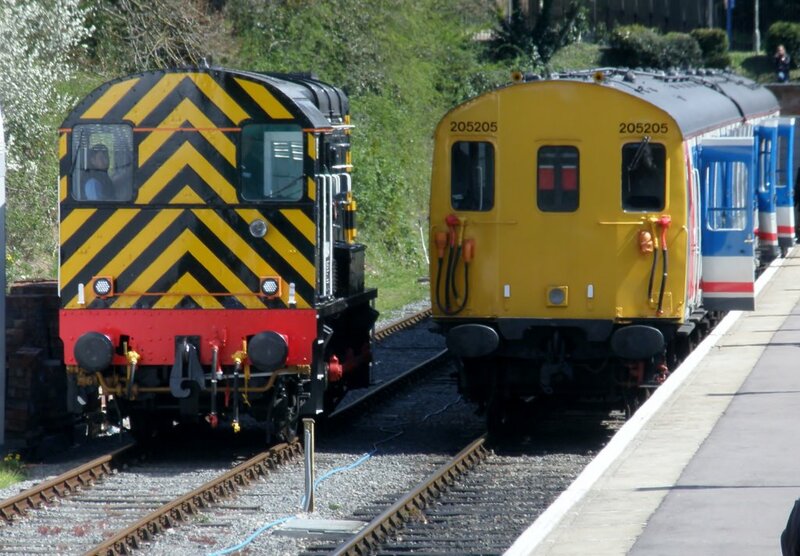 Until we meet again – the class 25 has departed for major work to be carried out. The C&W group have been carrying out works on several vehicles over the summer months, including BCK21059, the Taylor and Hubbard crane, the Blue/Grey TSO and the Finnish Loco, as well as assisting with the Halloween events. The BCK has suffered from a great deal of water damage, mainly due to condensation running down from the single gazed windows into faulty drainage systems. There was also no insulation between the outer metal skin and the internal panels. The water ingress also caused damage to floor panels. 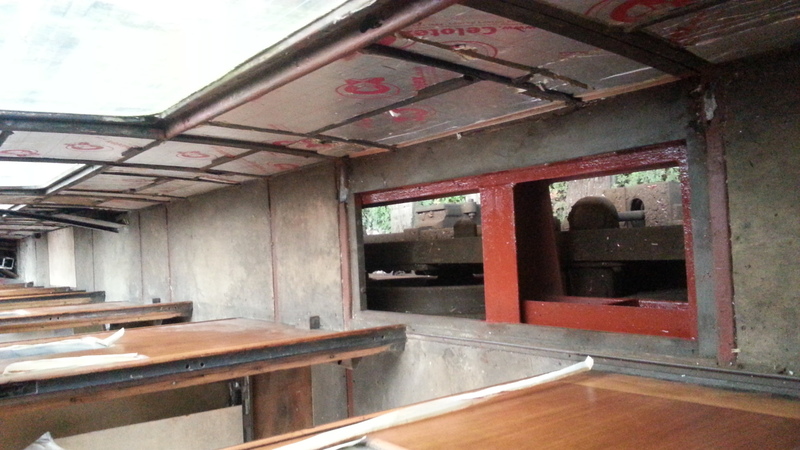 The old floor section has been removed in the first of the second class compartments. The under frame is being cleaned and treated by Dave. 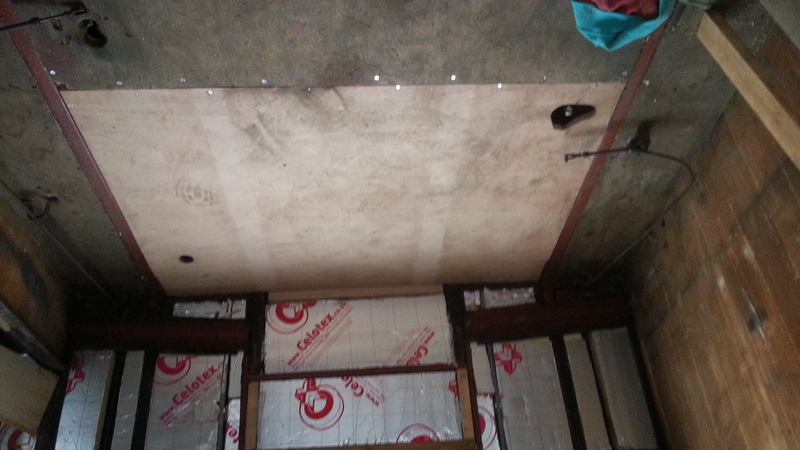 The new floor panel has been put into place. The new wall insulation can also be clearly seen. with red oxide, ready for the new section of floor to be installed. A new floor panel can be seen further up the corridor. As well as repairing the fabric of the interior, the carriage needs re-wiring, and to this end a circuit diagram has been ordered from the NRM. 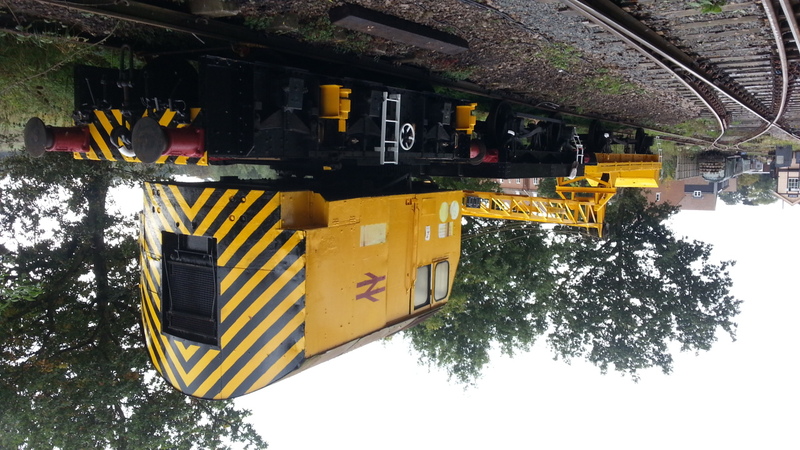 The crane has been smartened up with a coat of paint in readiness for a photo charter on 15th November. (This will probably have taken place by the time you read this). The crane, looking smart, ready for the photo charter. For some while, a rust patch has been pushing the paint away from the carriage – an almost perfect circle. The paint was removed, loose rust wire brushed off and a rust treatment applied. Once this had dried, filler was applied, sanded smooth, an painted. The rust-patch, with treatment applied. The C&W Group enthusiastically helped with the Halloween event, erecting the marquee, decorating carriages, and generally assisting where needed. 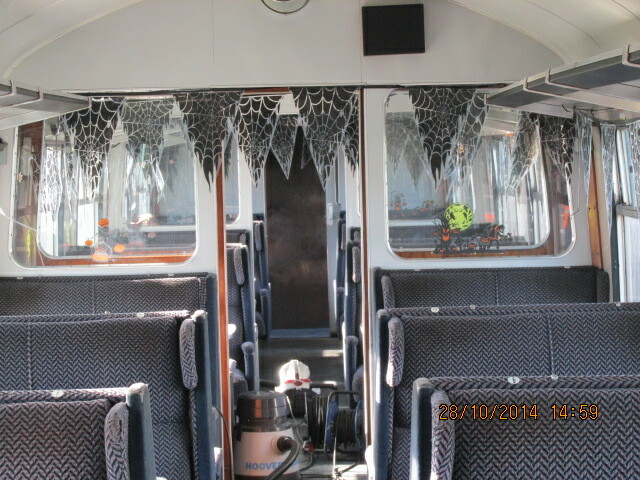 Suitably decorating the carriage interiors. There is an expectation that the Finnish Loco will be departing site by the end of November. Given that there is a growing interest in viewing the loco movement, it was decided to smarten it up from its dilapidated condition. The Finnish Loco, near the station building at Ongar, is due to leave soon. Its appearance has been neatened in readiness.